Fernando Alonso described his drive in the Azerbaijan Grand Prix, in which he took a badly damaged McLaren to a seventh-place finish, as "one of the best races of my life". Only now, though, can it be revealed exactly how good a performance it was. The Spaniard slipped under the radar in the immediate aftermath of the race in Baku, probably because events at the front were so dramatic. But Alonso's afternoon also deserves exploring. BBC Sport was given exclusive access to the two-time champion's car at the McLaren factory as it arrived back from Baku and can reveal the extent of the damage and the effect on its performance. Alonso himself was shown photographs of the damage to his car on Monday, and said on Twitter: "Now I have no doubt. It was an unrepeatable race." It's not the first time the two-time world champion has talked up his own performances since joining McLaren and being saddled with an uncompetitive car. Without judging the other occasions, though, this time it was undoubtedly justified. Racing director Eric Boullier, who showed me around the car, said the Spaniard's performance was "a mega race. What he did is unbelievable." Alonso was caught in a collision with two other cars between turns two and three on the first lap and suffered punctures in both his right-hand tyres. By the time he reached turn 15, two corners before the long pit straight, it was down to its wheel rims. The 36-year-old somehow dragged the car back to the pits, but in the process it suffered extensive damage. The aerodynamics of Formula 1 cars are extremely sensitive, and each flick and curve on the extensively sculpted bodywork is there for a reason - to enhance performance. I was not allowed to take photographs, for confidentiality reasons. But the most dramatic damage to Alonso's car was to what is called the 'tea-tray' - the part of the floor that sticks out under the drivers legs, and which helps define the airflow under and around the sides of the car. In the front of this there was a triangular hole, about 30cm by 20cm, as well as significant damage to the leading edge, as if someone had set about it with a powerful hammer. Some of the heavy tungsten ballast that is stored in the floor was missing. At the back of the car, there was damage along the right-hand side of the floor all the way from the very back of the diffuser - the upward slope at the rear - to forward of the rear wheel. Two sculpted curves on the right-hand side of the rear diffuser were gone. In front of the rear tyre, two key aerodynamic shapers were missing, too - what McLaren call a fence, a longitudinal curve, and a spat, a sort of vertical, rectangular scoop-shape. All in all, Boullier, said the damage cost "20 points of downforce, more or less - so half a second a lap". 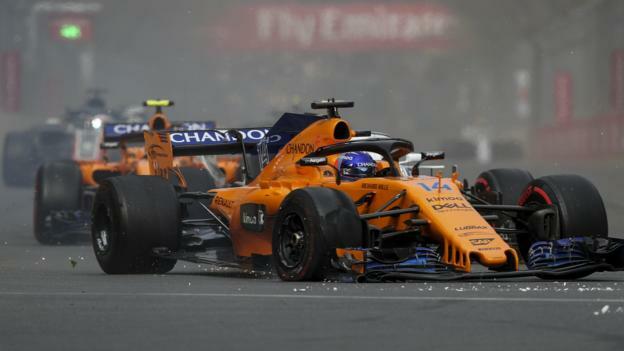 Despite this, after changing tyres and front wing, Alonso returned to the race and lapped faster than team-mate Stoffel Vandoorne on all but a handful of laps. How did he get it back to the pits? Even getting the car back to the pits in the first place was something of an achievement, Boullier said. "The front tyre deflated straight away after turn three and then it takes some time before you lose the tyre from the rim," Boullier said. "The rear right tyre deflated I think around turn 15. "You can see [from the television footage] that after entering the pit lane, the car is not driveable, and actually he hit the wall on the right-hand side. "At that stage, he told us after, he did not know how to bring the car to the pit. He didn't know if the car would steer. He just tried to go straight on the fast lane and he thought he would leave it there and we would take it out [of the race]. "At the last minute, he turned and the car steered into the pit-stop bay. We made a joke with him and said it was the best positioning of the weekend. "He said: 'Let's change the tyres and front wing and go.' From the pit wall, I saw these flames all around the floor. The car was on fire." McLaren could not see all the damage, because the front floor is hidden by the aerodynamic shapers behind the tyres. So after checking the car was structurally sound and safe, they sent Alonso back out with new tyres and front wing. He spent a couple of laps asking what they could see from the data and whether they needed him to change any settings. It turned out that, while it had lost downforce and was theoretically slower, it felt OK to drive. "Actually, the car was still more or less balanced, strangely," Boullier says. "The reason was there was this big hole in the front floor, so we lost downforce at the front and rear. So the car was not very well balanced, but it was still driveable. He didn't complain about anything, not even driveability." How did Alonso's performance compare with Vandoorne's? The Belgian was "struggling with his tyres more than usual," Boullier says, but Alonso finished two places ahead, and his average lap time was 0.521 seconds quicker, in a car theoretically 0.5 seconds slower. How did Alonso do it? This is not the first time Alonso has over-achieved in a damaged car. In qualifying at the 2006 Italian Grand Prix, a rear tyre failure left his Renault with broken rear bodywork, but he went on to set the fifth fastest time - and faster than team-mate Giancarlo Fisichella in a healthy car. Renault's sporting director Alan Permane, then a race engineer at the team, said of that performance: "Half the car was ripped off. We measured the downforce he'd lost, calculated what that should have translated to in lap time, and he lost nowhere near that. It's like he sort of refuses to accept it." Now, Boullier says: "He has this facility to switch his driving style always to suit the car balance. He is one of the very rare ones. Depending on the balance, whether you have front [brake] locking, rear locking, straight away he adjusts his driving to not hurt the tyres. In that case, it helped him a lot. "I think that's why he came back saying: 'Change the tyres, change the front wing, don't worry, I am going to drive it like it is.'" Boullier believes that Alonso's mindset in these early races has been affected by the team's difficult start to the season, with a car far off the pace they were expecting. After justifying their decision last year to split with engine partner Honda on the basis that they had one of the best chassis on the grid, McLaren have joined forces with Renault only to find they are around a second lap slower than Red Bull, who use the same engine. Alonso has qualified 11th once and 13th three times in the first four races. McLaren's lack of pace has led to chief technical officer Tim Goss being removed from his post. Yet, in the races, Alonso has taken three sevenths and a fifth, and he is sixth in the drivers' championship. Largely thanks to him, McLaren are fourth in the constructors' championship. This, Boullier believes, has influenced the team as well. After all, they could have decided to retire the car in Baku, given the extent of the damage. "Maybe we got conditioned as well by him all weekend saying: 'We need to finish the race; this is the key,'" Boullier says. "We also are in a different place. Qualifying pace is not our best and so we have shifted our mindset to: 'We need to grab any points we can.' And that means by any means we need to finish the race. "This is our mindset since Australia. We want to capitalise on the first four races and grab as many points as possible." Was it one of Alonso's best races? Drives like this go down in F1 folklore. Ayrton Senna winning in Brazil in 1991 stuck in sixth gear for the last few laps. Michael Schumacher finishing second in Spain in 1994 stuck in fifth gear for much of the race. Or Alonso himself in China in 2010, struggling with a malfunctioning gearbox while battling with Jenson Button's McLaren. Boullier has worked with Alonso at McLaren for more than three years, and before that they were rivals when the Frenchman was at Lotus - now Renault - and the driver at Ferrari. How does Boullier rate Alonso's race in Baku? "When you see the condition of the car, definitely it is one of the best ones," he says. "He did some other amazing things - some times when you feel he is in another world. "The consistency he had with the tyres and tyre degradation and managing the tyres, especially with the safety car and everything, and he did it. "Then, at the final safety car restart, we said: 'Oh my god, with the car he has, everyone is going to pass him.' But no." In fact, Alonso went on the attack, and took seventh place from Williams' Lance Stroll on the last lap. "He is a real fighter," Boullier says.